Urs (left) and Nik (right) both work for the same investment management company in Zurich! China’s place in the global market is growing fast, and MBAs with an understanding of business practices there stand in good stead when it comes to launching a career in Europe. 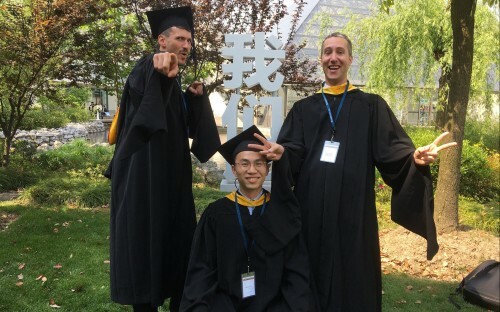 MBAs from the China Europe International Business School (CEIBS) are tapping into that, being given a holistic overview of business in China, alongside trips to Silicon Valley and Israel, an in-depth understanding of Big Data, Industry 4.0, and the Internet of Things (IoT), and the increasing demand for tech. “It’s very important to understand China and the ongoing digital market disruption [there] caused by Industry 4.0, the IoT, and Big Data,” says Niklaus Mueller, a CEIBS MBA graduate now working in Zurich for an investment management firm. Nik admits that the market in China is fragmented, with demand differing between provinces and cities—the CEIBS MBA gives students first-hand experience of this that sets them apart from others who haven’t been fully immersed in the world of Chinese business. “A comparably small portion of foreign MBA students are going to China and getting that experience there,” he explains. “[Companies] like and want global minded people, and certainly an understanding of Asia and the ongoing innovation and entrepreneurship there helps. China Depth Global Breadth is the way the CEIBS MBA is positioned—the focus is primarily on China, but there is scope for tapping into international markets and gaining an understanding of the health of business internationally. The CEIBS eLab—an incubator for entrepreneurial ventures within the school—offers students the opportunity to attend a five day visit to Silicon Valley, learn about the tech ecosystem there, visit companies, network with entrepreneurs, and gain an understanding of the tech scene in relation to China’s own burgeoning ecosystem. In the summer, students can also opt to travel outside of China for a company internship—Nik worked as an MBA Summer Consultant with Microsoft in Germany. But he admits the ability to disseminate knowledge of the Chinese market abroad is what stands out about the CEIBS community—spreading that knowledge is the mantra of the CEIBS Alumni Chapters, which aim to bring together CEIBS alumni from all over the world, in various global locations. Nik, together with fellow CEIBS MBA graduate Urs Casagrande, who works for the same investment management firm, also in Zurich, oversee the Alumni Chapter there. “We’re figuring out ourselves that the European network is not so strong yet, but we are really trying to establish a platform for European guys who want to go to China, and vice-versa, so alumni can maintain the China edge while staying [on the continent],” Urs explains. He admits that although it was the strength of his entrepreneurial knowledge obtained at CEIBS that helped him land his current role, knowledge of the Chinese market is indispensable, and that is what the Alumni Chapters hope to harness. Urs adds that, as it is often harder in the West to gather first-hand information about the Chinese market, it’s important to keep abreast of what is happening.